Suitable for vegetarians. 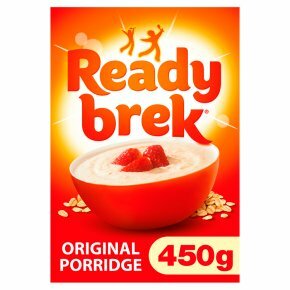 Lovingly made from wholegrain rolled oats, your bowl of Ready brek is packed full of goodness. Super smooth and with no added salt or sugar, start your day the Ready brek way... Rich in calcium* To promote healthy bones and teeth Source of vitamin D* To support a healthy immune system No added sugar or salt* For a better nutritional balance High oat fibre* To aid healthy digestion *Vitamin D contributes to the normal function of the immune system. Oat grain fibre contributes to an increase in faecal bulk. Oat beta- glucan has been shown to lower/reduce blood cholesterol. High cholesterol is a risk factor in the development of coronary heart disease. Coronary heat disease has many risk factors and altering one of these may or may not have a beneficial effect. One 30g serving provides 1.2g of beta glucan soluble fibre from whole oats and oat flour, which is 40% of 3g, the suggested daily intake. Calcium is needed for the maintenance of normal bones and teeth. Contains naturally occurring sugars. Great tasting oats in 3 easy to follow steps... 1. Mix 30g (5 dessert spoons) of Ready Brek with 150ml of milk or water 2. Microwave or boil on the hob for 90 seconds, stirring half way through** 3. Leave to stand for 1 minute, then enjoy! Have you tired topping your Ready Brek with... A drizzle of honey Sliced banana Halved strawberries Dried fruit **Based on 750W Category D and 1000W Category E microwaves. Please be careful with hot product or liquid. Once prepared, do not store or reheat. Please be careful with hot product or liquid.Once prepared, do not store or reheat. It's so easy...1 Measure 5 heaped dessert spoons (30g) of Ready brek into a microwaveable bowl.2 Mix with 150ml of milk and stir.3 Microwave for 1 1/2 minutes, stirring halfway through. *Stand for 1 minute before serving. *Based on 750W Category D and 1000W Category E microwaves. Or just add hot milk.Simply boil 150ml of milk and add to your bowl of Ready brek, stir and serve.